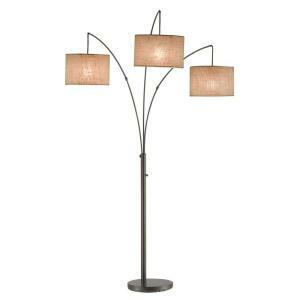 The modern Trinity Arc Lamp will make the perfect arc lamp for your home. The three fabric shades of this oversized metal lamp suspend from curved metal poles. The poles can be adjusted from side to side for your desired light location. The four-way rotary switch on the pole operates as follows: right only, left and center only, all on, all off. Each shade takes one 100-Watt incandescent or 13-Watt CFL bulb. This lamp comes in an antique bronze with beige burlap shades. Shade measurements: 7-5/8 in. H, 11 in., 11.5 in. and 12 in. Dia. Tbook.com crawls the web to find the best prices and availability on Lamps and related Tools and Hardware products like Adesso Trinity 82 inch Antique Bronze Arc Lamp. For this page, related items include products we find that match the following keywords: "Lamp" at our vendor partner Home Depot. Adesso Trinity 82 inch Antique Bronze Arc Lamp is one of 143 Lamps and related products listed in the Tools and Hardware section of Tbook.com If you have any questions on this product, please give us a call at 734-971-1210 during the hours of 9am - 5pm EST for assistance. Thank you for shopping at Tbook.com, the Internet Department Store!